Firefighters battled through flames and smoke to pull a woman from her burning Inverness home. 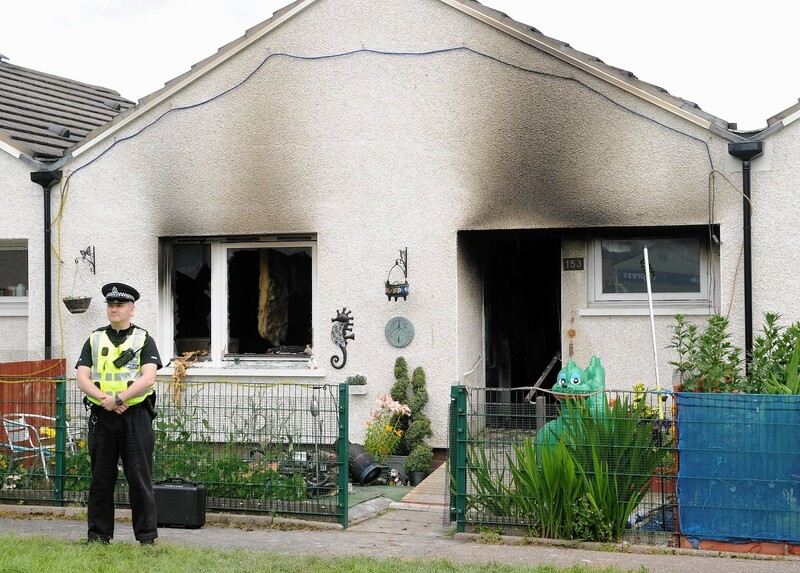 The pensioner was unconscious when crews reached her and had to be given oxygen as she lay on the grass outside her house as the blaze continued to rage. Neighbours feared she was dead as the emergency services fought to revive her before she was taken to the city’s Raigmore Hospital. The woman, named locally as Jessie Dryburgh and though to be in her late 60s, had suffered smoke inhalation and was understood to be in a stable condition in hospital last night. Firefighters wearing breathing apparatus entered her mid-terrace bungalow in Benula Road after receiving a 999 call. Flames and smoke were pouring from the windows of the single-storey building when they went inside and found Mrs Dryburgh trapped. Donald MacKenzie, whose second floor flat overlooks the three terraced houses, said he witnessed the events from his landing. He said that when he saw the fire brigade coming down the road there were more than 20 people standing outside the terrace unable to help. He added: “The fire was coming out the windows and it really was pretty bad. I thought she was dead when she was carried out but I am glad that she was ok.
“I saw her being rescued. The firemen took her out and laid her on the grass in front of her house and then the paramedics took over. Another neighbour said yesterday that Mrs Dryburgh was in a “stable condition” in hospital. Residents said Mrs Dryburgh was married two or three years ago, but her husband was not in when the fire broke out around 11pm on Sunday. She previously lived in a house round the corner in the same street. She works in a charity shop in Grant Street not far from her home in the city’s Merkinch area. The cause of the fire, which burned for almost three-and-a-half hours, was still being investigated by police and the fire service last night. Fire brigade station manager Steven Bassindale said: “When they arrived crews were faced with a very intense, well-developed fire. Three fire units went to the scene, and a thermal imaging camera was used to check the properties for hot spots. Yesterday, the walls above the front windows and door showed extensive fire damage and a blackened gas cylinder was amongst the debris outside the door. Insulation from the attic had also been hauled down to prevent fire spreading through the roof space.